Have you experienced hints of raspberry, swirls of lily, or essence of grass? Yes, in your yard, but perhaps in your favorite bottle of wine. And for anyone that drinks wine probably has oodles of wine corks! What do you do with all of them? And what do corks have to do with gardening? Well, corks are hand-harvested and made from the cork oak trees Quercus Suber from Spain and Portugal. They don’t soak up water, do not rot, impervious to air, and can mold itself to the contour of any container. Classy looking, smart and upcycling! A cork tree is harvested when it is 25 years old and then every 10 years. Stripping this bark does no permanent damage, and can be done, on average, 16 times in its 150 to 200 years. Both countries are diligent about sustainability by replanting cork oak trees. These trees also produce acorns which feed the wild pigs and other animals throughout the countryside. So, what does this have to do with you? 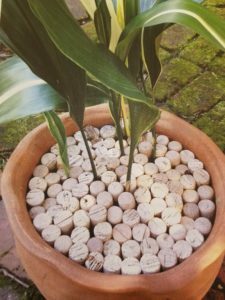 Well, these corks can be used as mulch in your plants! By placing corks upright and tightly packed on the top of the soil, they hold in water and the soil in place. Since these won’t decompose, they won’t break down, and they are easy to take out to work on your plant or replace. There is enough space in between each that air can still circulate and plants can easily sprout through. 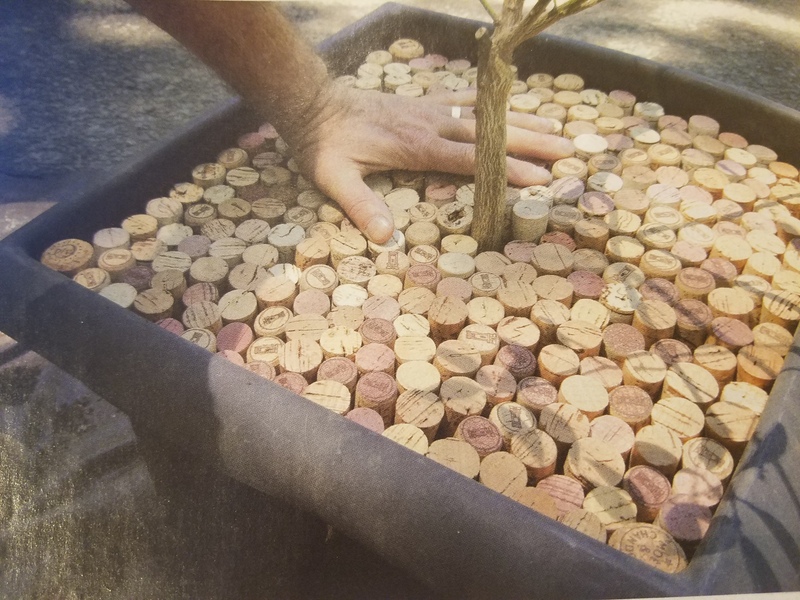 Water and fertilizer can go right on top of the corks, and to check the moisture, simply pull out a cork and check the soil with your finger or poke a chopstick through the gaps. Mulching is an important part of gardening and your plants’ wellbeing, for both indoor and outdoor plants. Not only do you get to recycle your corks in a fun, decorative and useful way, and keep your plants healthy, but this gives you an excuse to enjoy another bottle of wine in your garden! Sources: Hyman, Frank. “Corks, of Course.” Horticulture Jan./Feb. 2017: 64-65. Print. MacNeil, Karen. The Wine Bible. New York: Workman, 2015. Print.